As I wrote recently, one of the important effects of the iPad is that it’s shown that the WebKit browser platform is important beyond the world of mobile devices, with its use on Safari for iPad and also for Google Chrome. “WebKit” will likely soon become part of vocabulary of the wide Web-using world. Now, though, it’s talked about mainly by geekish tech people, so it’s hard to sift out non-geek talk about it that can inform the rest of us. The article by Gecko and WebKit developer Ian McKellar (@ian) that I’m excerpting below does a good job of this. McKellar states strongly his view that the programming environment of Mozilla/Firefox is outmoded and that the browsers of the future will be WebKit-based. About the sub-title above: “The browser platform wars are over …” — This is from a tweet by McKellar, in response to my tweeting a link to his article. Although his tweet includes IE (Internet Explorer), his article is only on WebKit and Mozilla. Gecko (in McKellar’s quote) is the browser platform for Firefox. Mozilla (in the excerpting below) is closely associated with Mozilla Firefox. In my experience (8 years building Mozilla based products and playing with WebKit since 2003) there are a few clear technical and social differences that can make WebKit a more attractive platform for developers than Mozilla. The scale and complexity of the Mozilla codebase is daunting. Mozilla advocates will say that that’s because Mozilla provides more functionality, but the reality is that even if you don’t want all that functionality you still have to dig through and around it to get your work done. Much of the Mozilla platform is poorly documented, poorly understood and incomplete … while WebKit is smaller, simpler and newer. The scale of the Mozilla organization is also daunting. Mozilla’s web presence is vast and is filled with inaccurate, outdated content. Their goals are vague and mostly irrelevant to developers. By contrast WebKit’s web site is simple and straight-forward. Perhaps I’m short-sighted, but I don’t see a clear path forward for Mozilla in competing with WebKit as a platform for web content display. The long history of Mozilla have left them with a large, complicated codebase that’s not getting smaller. The rapid growth and defensive attitude of the organization (probably brought on by the Netscape / IE wars) has left it without a culture that welcomes friendly competition. … I’m just glad we have an alternative web content platform. So, where to to from here? As iPad-like tablet devices nudge into the world of desktop computing, it seems likely that WebKit browsers are the future. Though FireFox and Internet Explorer will probably continue to dominate the desktop for some time, the WebKit future is available now on the desktop in Google Chrome — I’ve started using it regularly, and I find it superior to FireFox in many ways. So consider giving it a try. Posted in Mobile, PicsNo, Uncategorized, WebKit. When I wrote on the WebKit Revolution in August, I didn’t find the good graphic below, I think because of the way it was titled and placed in excellent articles by Jason Grigsby (@grigs). So, thanks, Jason, and I hope you don’t mind that I’ve tweeked the text accompanying the pie graph, to show more clearly the platforms involved. 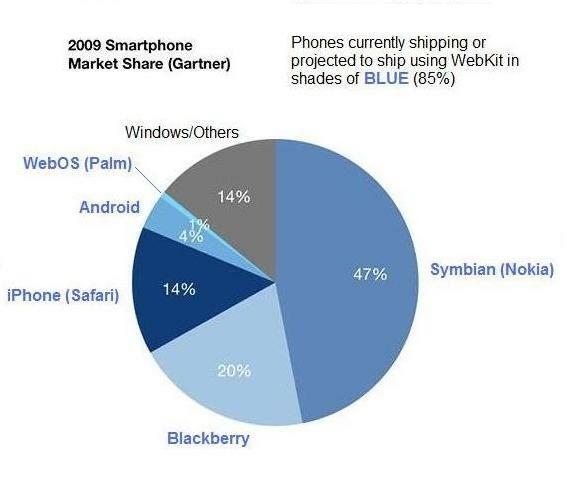 The graphic is a bit dated, since it doesn’t include the iPad, and no doubt a more current version would show a larger share for iPhone and Android. Also, the recent introductions of a WebKit browser on the Kindle 3 would make the WebKit dominance even more noteworthy. 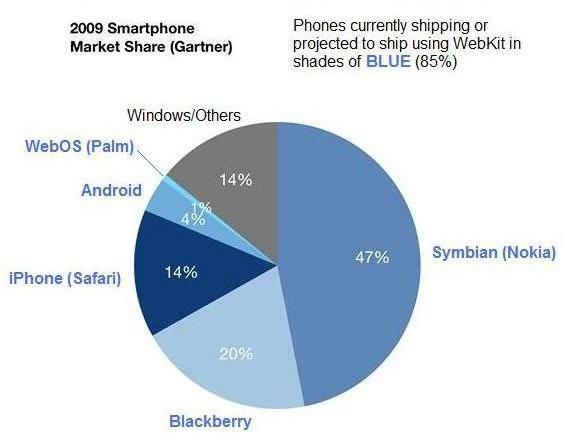 But the graphic still does a good job of showing the strength of WebKit browsers on mobile devices. Note >> All the pieces of the pie in shades of BLUE (all but Windows/Others) are based on WebKit. Posted in Mobile, PicsYes, Safari, Uncategorized, WebKit.